The "In The Dark" album was released just the month before this show, and "Touch Of Grey" was lighting a fuse on what would be an explosion of Grateful Dead popularity to eclipse the prior twenty years. Meanwhile the 1987 Dead were operating in their "business as usual" mode, on tour across the country. There's no denying my personal preference to the Dead's music which came prior to this point in their career. The somewhat pre-1985 lopsidedness to the shows reviewed here on the Guide make that rather clear. But that doesn't mean there oughtn't be some respect paid to often infamously regarded pockets of the Grateful Dead's legacy. For me, the best way to honor and experience these moments comes from stellar audience recordings (by the late 80's many recordings were literally exceeding all expectations of quality). 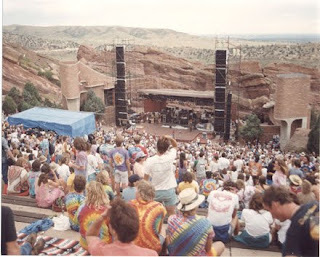 And here we come to the outdoor Red Rocks venue in Morrison, Colorado, providing an ideal setting for some fantastic sounding music. In 1987 it can be difficult to take the obvious vocal strain that health and drug issues had exacted on Garcia, and to me the band more often than not sounds like a caricature of itself. They sound a bit like a band pretending to be the Grateful Dead—mimicking what one would expect to hear more than simply creating music together. A bit harsh perhaps, but hard to deny. Yet through it all, the Dead were always able to pierce the membrane separating that for which we would forever forgive them, and that for which we would always turn out to share with them. They still had "it" just under the surface, and though it came into full view less and less often, it was never completely absent. So here we land in the absolute sweet spot at a gorgeous venue. This recording sounds good enough to make the hair on the back of your neck stand up. If you're going to traverse 1987, it may as well be a summertime outdoor show that sounds this good. The first set is tastefully delivered, and while occasionally veering into that "Dead being their own cover band" feeling, this is no doubt a good time had by all. Bird Song is very satisfying as the structured musical experience peels away revealing a more fractaled landscape. Worth noting is the level at which the band is paying attention to each other. As Jerry hits a sour note and does an admirable job of saving himself, the other band members pick this up and highlight the off-played minor note until it becomes part of the musical tapestry. This seems to fuse the band mates and the music starts to soar, catching energy and spiraling aloft. The jam doesn't last long (a 1987 characteristic), but it's thoroughly authentic Grateful Dead. They drop directly into a nice Music Never Stopped which fires on all cylinders to wrap up the set. The end jamming will put a smile on your face for sure. China>Rider opens the second set with the band in its comfort zone. It's hard to find fault here, and very easy to just let yourself go. 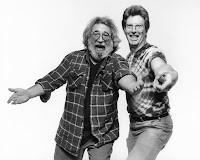 When Jerry absolutely roars out his "northbound train" lyrics, its one of those "wow, Jerry's really into it" moments that are always precious to bump into in these latter years. Terrapin Station has a nice extended final section where the song's theme repeats and coils into itself again and again. It goes on long enough to become somewhat hypnotic, somehow synching your brainwaves into a passage where time is hard to pin down. This is the effect one typically looks for in the end refrains of Terrapin, yet does not often find. Drumz is very nice. Overlaid with musical tones and orchestrated thunder, the show goes deeply into Space, holding nothing back as the vortex of psychedelia dissolves the mountain landscape of the venue into liquid winds of light and crystal rivers. Other One whispers its way into view, and Healy has Bobby's voice tweaked, taking an unfair advantage of the lysergic energy floating all around. While it's hard not to wish Other One was played out a good deal longer, the show is certainly delivering the goods as the band rolls nicely into Dear Mr. Fantasy and then Wharf Rat. The set ends with Lovelight, and no matter how much I try to let these Bobby versions stir up the embers of Pigpen Lovelights gone by, it ain't happening. This one smacks of the Dead dusting off a version of themselves much better left to the history books. If I'm jaded, so be it. Quinn The Eskimo redeems things in the encore spot, clearly capping the evening off with a joyful energy. A very satisfying audience recording capturing the band in good form standing on the verge of titanic popularity and a truly inspirational creative comeback in the years to come (1989-90), this show provides a nice window into what 1987 was all about. I've been working on a theory (in part inspired by your work) that one of the most vibrant, albeit very short-lived, periods of the 1980s was the Winter-Spring of 1987, after Jerry returns from his 1986 swoon. 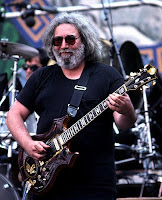 I keep listening to the East coast Spring '87 tour and am blown away by the energy, the flow, Jerry's playing, and the tightness ("sync") of the band. There's a string of shows in that tour -- Hartford, Philly, Worcester, Meadowlands, Chicago -- in which the band clicks so well night after night. Jerry's excitement and enthusiasm are palpable and the band and crowds are revved. I'm still listening and fleshing out my theory, but most of those shows (and I was at a few of them) to me, exceed this one at Red Rocks and might, pound for pound, match or exceed the best shows later in 87 -- I think of the storied 9/18 at MSG. Give Spring '87 a listen. To me there is something fresher, more dynamic, and more appealing than even '89-90, and no doubt later in '87 and in '88 the band kind of bogs down into that pleasant but unexceptional late 80's mode. You might find an inspired and unheralded body of live work there. Thanks the for the ongoing sustenance and nourishment you give to my own "Dead" head. If you want to sum up 1987, cover the second Hartford show from the spring tour. Rocks from the start to the end, there is a great audience tape that circulates to boot Ice and I know you love those. Never saw another show that came close to rivalling Jerry's interest or enthusiasm and the second set is a monster. Best Touch of Grey ever for my money and a terrific Morning Dew to boot. I agree that the 1987 Spring Tour was brilliant, and am partial to the Hampton shows, the first shows on the East Coast since Jerry's recovery. But, to my mind, the whole year had a great deal to recommend it. The Roanoke shows stand out for me from the East Coast Summer Tour, if only because I was there, but I know there were many others. On the whole, I think that 1987 was a much better year than 86 or 88, though, as always, there were many, many great shows and brilliant moments. While I attended most, though not all, the most storied '89 and '90 shows, 1987 is the year that made me a deadhead. I definitely agree that audience tapes are the way to go for this entire period. I respectfully disagree with your characterization of 1987, and of the band's evolutionary arc in general. The March Hampton/Hartford/Spectrum shows were as high energy as I've ever heard on tape. Be careful, the "It" factor is extremely subjective! I just listened to a run of Spring '87 from 3/27 Hartford thru 4/6 Meadowlands, with Philly and Worcester in between, and I just want to chime in with the others. After a handful of Bay Area shows over the winter, Jerry and the band seemed to be finding their groove again. Meanwhile, the Northeast audiences clearly were thrilled to see Jerry back on stage, and the band fed off that energy. No, it's not where to go for a lot of kaleidoscopic cosmic exploration, but if you like listening to high-energy Dead playing with intensity and heart, there's a lot of Spring '78 in that Spring '87 tour. Check out the Spectrum shows for a taste (all captured by some very good AUDs), but all of those shows from late March and early April are a lot of fun. I'm looking forward to hearing more from the tour.